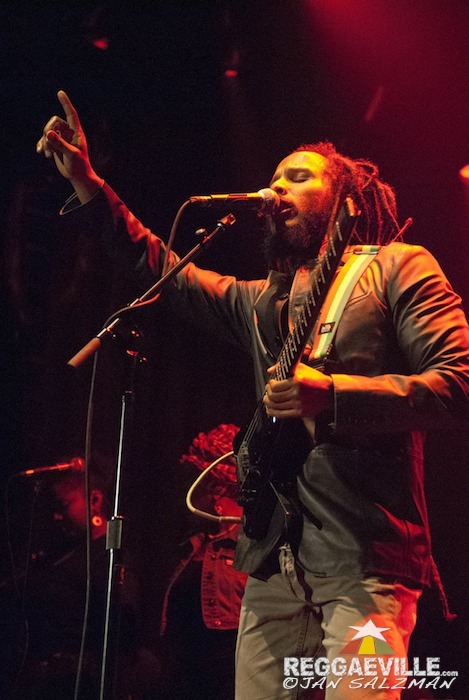 A consistent hallmark of a Ziggy Marley concert is the attention to detail. Thematic implications, shifts in tempo and mood, plus doses of audience interaction all populate his 90-minutes-plus performances, buttressed by a backing band that bops, one-drops, and locks down an arrangement as well as any, leaving plenty of space for emotion and spirit, but little margin of error. When three title tracks from Marley’s discography and the opening cut off his new Fly Rasta release are the first four songs of the reggae icon’s show at Club Nokia in downtown Los Angeles, a kick-off to his upcoming months of promotional and touring appearances throughout Europe and the United States, it is unlikely a coincidence. The better bet is that Ziggy is making it clear his vision remains forward, respectful of what’s come before, but eager to see, and say, what’s next. The curtain parted with Love is My Religion, the 45-year-old reggae icon easing to center stage, his nine-piece band taking a slightly West African tack to the title tune from 2006, with guitarist Takeshi Akimoto’s fluid melody lines accentuating the groove. Followed closely by Wild and Free, from the eponymous 2011 album, the paean to the cannabis plant felt renewed in light of the nation’s recent legalization victories in several states. “Tonight, you’re going to hear some strange sounds”, offered the dreadlocked singer before launching I Don’t Wanna Live on Mars, the first song on Fly Rasta and a bit of a right turn into alt-pop. For many in attendance, it was their first exposure to Marley’s new record, and while it collected an enthusiastic response, it was supplanted by Conscious Party, and roars of approval for the hit, a Melody Makers staple from 1988, released before many of the Nokia’s bobbing, dancing throng were even born. A slew of album tracks from Marley’s most recent trio of releases followed, starting with a debut of I Get Up and into to Reggae in My Head, and the night’s initial call-and-response with the crowd. The usually dark Personal Revolution projected a slightly brighter glow, before another debut, the nimble and pleasing Sunshine. A mid-point highlight, Get Up, Stand Up, and War, the first two of three Bob Marley classics to be played, seducing their way into the affair, giving rise to the roomful of camera phones. Electrified ska from Black Cat and a couplet of Fly Rasta cuts Give it Away and Moving Forward, the latter featuring the increasingly present vocals of guitarist ‘Beezy’ Coleman, slid aptly into Forward to Love, and Bob gem, Is This Love, a dynamic showcase of timekeeper Santa Davis’ legendary versatility. More audience participation, this time on closer True to Myself, finished with the band exiting as one, a bit surprising to the near-capacity crowd that only after a few minutes of empty stage, clamored for the ensemble to return. Encores of “Tomorrow People” and Look Who’s Dancing bookended the debut of Lighthouse, an acoustic-laden ballad that aspires to arena rock sways and lighters held high, but tonight felt formative, not yet triumphant. By contrast the final number, Fly Rasta, reveled in a celebratory flourish, complete with Ziggy on conga and cymbal, his percussive patter and expressive grin telegraphing the joyous culmination of his newest effort and a perpetual interest, if not optimism, for the road that lies ahead.